The ZeroG Balance and Gait Training System by Aretech, and the benefits it delivers, are now available in Abington, PA, at Brookside Healthcare and Rehabilitation Center. ZeroG is a robotic, body-weight support system mounted on an overhead track which provides dynamic body-weight support and fall protection, while also monitoring the individual patient’s movements from above. People recovering from stroke, orthopedic injury or surgery, spinal cord or brain injury, amputees, or those with balance disorders will experience high-intensity rehabilitation much earlier in their recovery using ZeroG. They will have the safety and confidence to practice functional and real-world balance activities such as walking, getting up from a chair or the floor, squatting and climbing stairs. 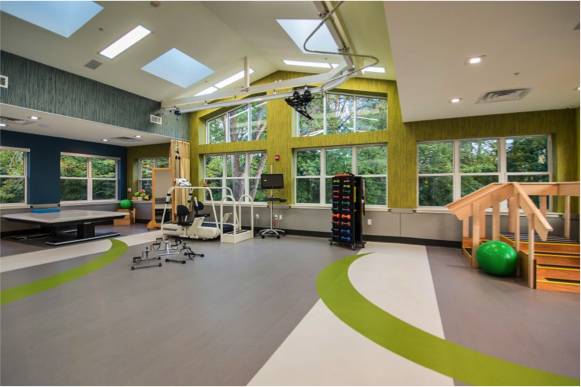 By offering such innovative and advanced rehabilitation using ZeroG, Brookside Health and Rehabilitation Center can now offer patients in their skilled- nursing facility a post-hospital recovery that is typically only available in acute rehabilitation settings. In a study by Horn and colleagues (2005), they showed that the two most important factors related to recovery of function were early interventions and high intensity. The ZeroG System provides and encourages early, high-intensity rehabilitation to best achieve individual outcomes. Please contact Meg Judson, M.H.A., Corporate Director of Business Development, for more information, or to see ZeroG for yourself. Email her at judson@nationwidehealthcare.com.